In this newsletter, I conclude our discussion on guru tattva by approaching this topic from the perspective of a guru. I humbly believe that, in doing so, I speak on behalf of other gurus, both diksa and siksa (including counselors, mentors, and teachers) and thus present their vision and realizations as well. I guide many devotees who are not ready for initiation, or not even thinking about initiation. Through the exchanges we have over a period of time, I can see how their willingness to be guided, to reveal their problems, to “take shelter,” and to apply what I suggest helps them in many ways. I can see how this guidance will enable many of them to someday become qualified to take initiation. Does this mean they should someday become my initiated disciples? This is a good question. First, let us understand that I don’t have to be, or may not be, the only person from whom they receive regular instructions or with whom they have such a close relationship. Since one can have many siksa gurus, it is common that one may find guidance and inspiration in many places. One should never feel this is wrong, and thus limit oneself to the wonderful guidance they can get from the many senior devotees in ISKCON. If we see the oneness of guru, that Krsna is the guru, and that the guru represents Krsna and Prabhupada, then we see the oneness of all gurus in their guidance and desire to help us advance in Krsna consciousness. In this sense, we should be open to taking guidance from many, and to take more shelter of any devotee that inspires us, even if he or she is not a diksa guru – and even if they do not plan to become a diksa guru. Take siksa from many sources. After doing so for a period of time, it should become more and more obvious that one of these devotees inspires, helps, guides, relates to, motivates and builds your faith and desire to surrender in a special way. That is normally the person from whom you would ask initiation (provided they give initiation). 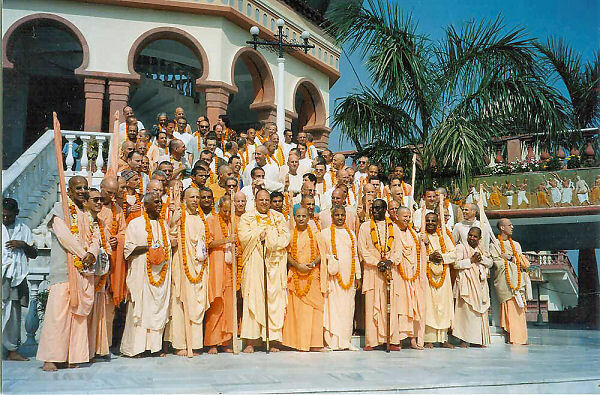 For devotees who are making a decision about whom to approach for diksa, and for those who help devotees in making these decisions, I would like to offer some helpful points of consideration that are gleaned from real life in ISKCON. . I don’t offer these points as an absolute criteria for choosing a guru, but as points to consider when choosing a siksa guru. How often will you see your guru? Does he live or travel in parts of the world that are far from where you live and rarely, if ever, come to where you live? In other words, is it important to you to have some regular personal contact with your guru, or are email and online classes sufficient (if he does email and have classes available online)? Can you correspond with him regularly? Is he too busy or does he have too many disciples for you to get regular personal instructions? This question also should take into account how often you feel you will need personal instructions. Of course, some gurus can provide such instruction through their senior disciples whose association is more easily available; or some devotees will be able to get this kind of guidance from others and be satisfied with this. However, others might feel isolated from (or even neglected by) their guru when it is not possible for him to give regular personal guidance. Can you help him in his service? For some devotees it is important to have direct service to their guru. If this is important to you, consider if there will be opportunity and facility for this? Also, consider if he emphasizes, or works on, projects that do not relate to your service, or service that you are not interested in or inclined to work on. Is his focus, for example, on developing varnasrama and working on farm projects, whereas your nature and inclination is to develop preaching programs in big cities? Will his emphasis on these specific projects make you feel guilty that you are not working on his projects, or even perhaps undermine your desire to do your particular service? Does he tend to have an approach to Krsna consciousness that is in line with your way of seeing the world? Does he tend to be very traditional, strict, formal, etc., in his approach to teaching or practicing Krsna consciousness (other aspects of his personality that you can add to this list are: philosophical, academic, too soft, too disciplinary, etc.)? In other words, do his nature and style of preaching Krsna consciousness relate well to, or is it compatible with, your nature and understanding and the way you approach spreading Krsna consciousness? Do his actions represent your idea of guru? Do you have an image of guru that is orthodox and thus is it possible that a guru who doesn’t adhere to these standards would be difficult for you to follow? Or this question can be approached in the opposite way. Does he adhere to standards that are, in your mind, too formal, strict, outmoded or orthodox, and thus not relatable to you? You may think these considerations to be mundane, but Bhaktivinoda Thakur, in quoting Sanatana Goswami’s advice that the guru and disciple observe one another for one year, says that part of this process of observation is to determine if the guru and disciple are a good match. It does happen that some disciples have difficulty accepting instructions or opinions from their gurus because of some or all of the above reasons. These are realities we should be aware of. Connected to the list above is the problem of expectations. A disciple may have certain expectations at the time of choosing a guru or receiving initiation, expectations that either the guru cannot fulfill, that no guru can fulfill, or that circumstances may later make it difficult or impossible for the guru to fulfill. So it is important for both guru and disciple to be clear about expectations. It is important to know that the guru’s perceived inability to fulfill some of these expectations is not simply related to his nature or limitations (he won’t spend time counseling female disciples, deal with householder problems, etc.). But they may be based on a misunderstanding that you have of a guru’s position. Some prospective disciples have, as I explained, a stereotyped (mis)understanding of the position of their guru, and may feel let down in the future when they find out that their guru is not a maha-bhagavata who is directly speaking to Radharani; doesn’t have extraordinary powers; doesn’t exhibit ecstatic symptoms, may not understand the finer points of rasa, etc. One of the original eleven gurus in ISKCON tells us that his early disciples used to glorify him by saying that, “He is taking prasadam with Radharani.” After a number of gurus fell down and ISKCON devotees became more clear about what a guru is and isn’t, this kind of glorification changed to, “Thank you, Gurudeva, for steadily following the regulative principles.” The understanding that the main qualifications of a guru are to be an obedient follower of their guru and a good example of the latter’s teachings had dawned. The institution or the person? Often, more than making a personal connection with the guru, one makes a connection with the institution of the guru: the many disciples, books, programs, etc., that the guru has. For some devotees, this is exactly what inspires them. This gives them what they want and need. They feel sheltered by a large family of disciples, and sheltered by some or all of the programs the guru has developed. Others who want or need a more personal connection would do better to find a guru who can give them more personal guidance. On the other hand, sometimes a devotee may choose a guru with many disciples to avoid a deep personal connection with him, and in this way become less accountable to his guru. This, of course, is not the basis for choosing a guru. Some devotees today look back on the time when they accepted their guru, and realize that they made less of a personal choice and more of a social choice, sometimes even accepting the diksa guru at the expense of recognizing the deep relationship they had with one of their siksa gurus. In retrospect, they realize that, at the time, they were unable to understand or acknowledge that their siksa guru was indeed a real guru, someone who played – and could have continued to play – a significant role in their life if only they had recognized the importance of their relationship. You might then ask, “Should I necessarily take diksa from the siksa guru who is giving me the most significant guidance?” Ultimately, every situation is different and personal, and there may be advantages or disadvantages to this. However, Srila Prabhupada does say that generally the siksa guru goes onto become ones diksa guru. access to. What I have done in the last three newsletters is make you aware of important guru/disciple dynamics, and give various perspectives on this issue for your own consideration. It is not a black and white issue. Sometimes, just having an advanced devotee as one’s guru, knowing that he is powerfully engaged in devotional service, having access to his lectures, feeling his mercy through following his instructions, being engaged in service, and als having good sanga is all one needs to be perfectly situated in Krsna consciousness. Speaking for myself – and I believe I speak for other gurus – whatever good qualities you see in us, whatever success we have, or whatever opulence we possess, are all due to Prabhupada’s mercy. Failing to follow his orders will turn us into ordinary people battling with our mind and senses, trying to squeeze out some happiness from this world. Therefore, any glorification of Prabhupada’s disciples who have become guru is direct glorification of Srila Prabhupada, and any service offered to them is service to Prabhupada. Prabhupada wanted his disciples to be glorified. He said the more they are glorified, the more he is glorified. And of course, they are glorious because they serve Prabhupada, the most glorious. If there is anything I can do to help you better understand these topics, please write to me.